When you come across something in your wardrobe that’s looking shabby, it can be tempting to consign it to the bin or drop it off at the charity shop. But if the pills on your sweaters have got pills, or the soles are coming away on your best pair of smart black shoes, please don’t do anything hasty. Instead, try one of these great DIY SOS tricks to breathe new life into your old favourites – they might just have years of use left in them yet. Make your belt the perfect fit. Whether you’ve shed a few pounds or put a few on, it’s easy to make extra holes in your favourite leather belts using a power drill. Using a ruler, follow the spacing of the existing holes (usually an inch apart) and mark your new hole on the back of the belt. Place your belt on some scrap wood. Make a dimple where you want the hole with a sharp knife and select the right drill bit for the size of hole. Slowly and carefully drill out your new belt hole. Easy. Someone stepped on your blue suede shoes? Fix ‘em! Don’t worry if someone has stepped on your blue suede shoes, there are plenty of home remedies for restoring suede to its former glory. Try using a pencil eraser to gently rub out the stain. If this doesn’t work, gently rubbing with a new emery board may lift it out. If your suede is looking flat and tired, you can lift the fibres gently by rubbing with a soft toothbrush or even a piece of stale bread! If your sweaters are looking pilly and fuzzy – under the arms is usually the worst spot – a simple disposable razor can bring them back to life. Get a brand new razor. Lay your sweater somewhere flat and hold it tightly with one hand whilst razoring the pills with the other. Use short quick strokes. Don’t press too hard or you may cut through the fabric. Start somewhere inconspicuous if you don’t trust yourself to start with. It’s easy to cleanly and securely re-attach the sole of your shoe without recourse to the cobblers. You’ll need sandpaper, a lolly stick and a strong adhesive (preferably not superglue). Clean the sole and upper leather of your shoe around the offending gap. Remove any old glue with sandpaper – this bit’s very important; it will help the new glue to stick. Use the lolly stick to get the glue into the gap. Apply pressure to make the two pieces stick together. Then put your shoe on and use your body weight to get rid of air bubbles. 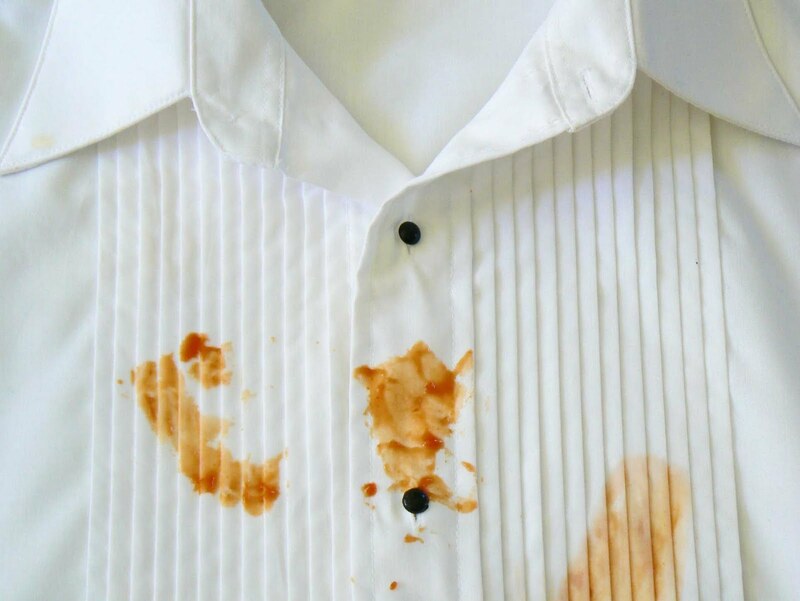 Many a shirt and tie have been ruined by stray drops of bolognese sauce or a drip of sandwich mayo. If regular washing doesn’t do the trick, try one of these surprising home remedies. If the stain is fresh, sprinkle baby or talcum powder on to the stain and leave for half an hour – the fine powder will soak up the oil. Brush off the residue and then wash as normal. For older stains, pour fresh oil (yes, more oil!) onto the stain to renew it, then add baking soda and give it a good scrub with a brush. Add neat washing up liquid, scrub again and then wash as normal. And Hey Presto, oil stain gone! Salvage your trackies with a safety pin. It’s easy to lose the drawstring of your favourite swim shorts or pyjama bottoms. But never fear – it’s almost as easy to replace said drawstring. You’ll need something threadable (ribbon or tape), some scissors and a safety pin. Measure your hips and add ten inches to the measurement to get the right length of drawstring. Cut the string and attach a safety pin to one end. Work the head of your safety pin into one of the drawstring holes, threading it all the way through and out the other side. Tie knots on either end and you’re done. So next time your wardrobe is screaming “SOS!”, try out one of these simple DIY tricks. ← Do you know these shoe shopping tips?